Welcome to my Behringer X32 FX Series tutorials. 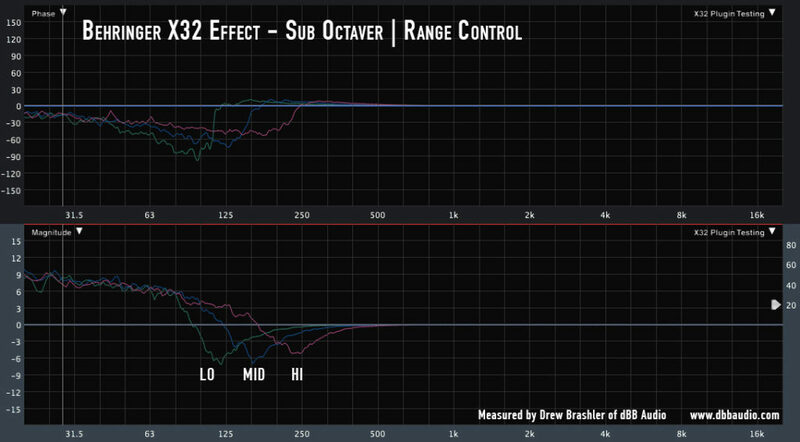 Today we are going to be looking at the Sub-Octaver. 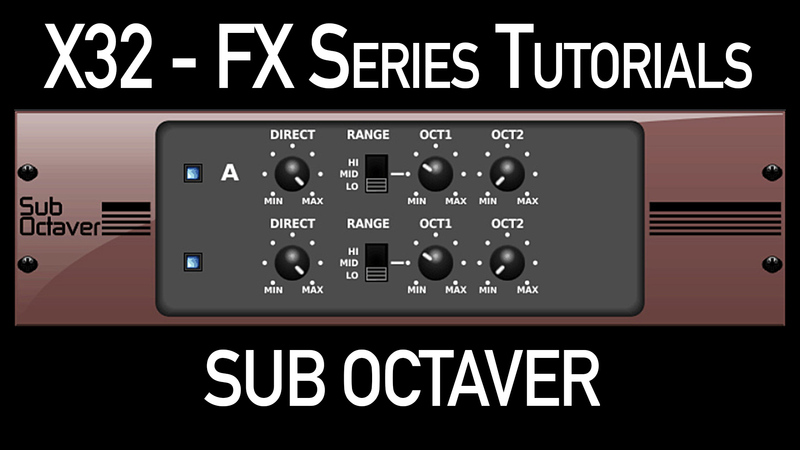 The Behringer Sub Octaver is an effect that is built into the Behringer X32 & Midas M32 Effects Rack and provides sub-harmonic and harmonic content to the applied signal. 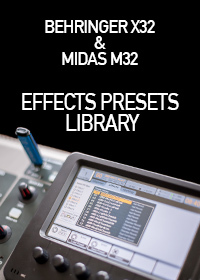 This is useful if you are wanting to provide more low end on a specific instrument as an effect. The Sub Octaver is only offered in a single configuration with separate channels for both A and B sides. Technically this is a ‘Dual’ configuration, but would work on a stereo pair if you routed both L and R into A and B. A delay of 0.67ms will occur when this effect is inserted, active or inactive. Active – Turns on and off the effect. Dry – The Dry controls how much of the original signal is left above the crossover point (set from the range). Control allows for adjustment from 0% to 100% in increments of 2%. Range – Range sets where the crossover point of the effect’s wet & dry signal, but also controls where the effect will ‘listen for’ content to provide sub-harmonics on. Control allows for adjustment of LO, MID, and HI. Octave -1 – Octave -1 controls how much Sub-Harmonic content is created 1 octave below the original frequency. Control allows for adjustment of 0% to 100% in increments of 2%. Octave -2 – Octave -2 controls how much Sub-Harmonic content is created 2 octave below the original frequency. Control allows for adjustment of 0% to 100% in increments of 2%. FX Home – Pressing this button takes you back to the ‘home’ tab of the effects. One thing to notice about the Smaart measurement of the Dry control is that the effected signal below the crossover point (250 Hz in this example) is slightly reduced. At 18% Dry, the effected ‘wet’ signal is -3dB down in comparison to 100% Dry. Range controls the crossover point of the effect in regards to the wet/dry signal. The dry signal is the unaffected/original signal, and the wet signal is the effected sub-harmonic generated content. 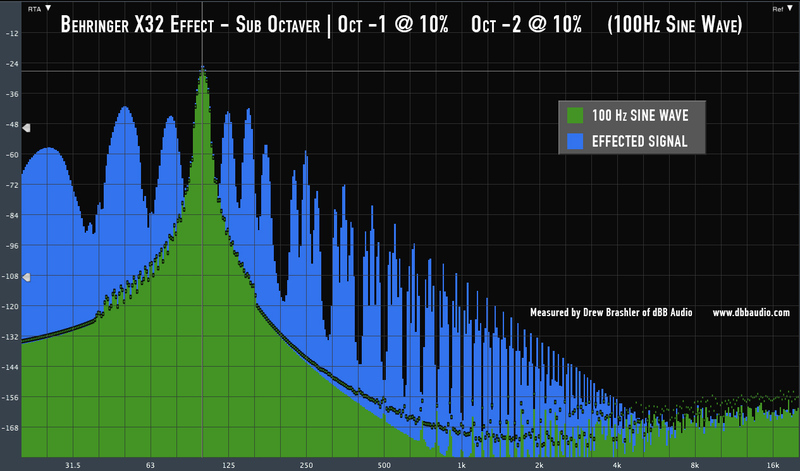 By my estimates, the Dry signal has a high pass crossover filter of -6dB/Octave. The Wet signal has a low pass crossover filter of -12dB/Octave. The use of the HI Range will give you more sub-harmonic content spread over 20-250 Hz, where Low will give you sub-harmonic content from 20-120 Hz. This effect is a sub-harmonic generator, however it also creates harmonic content above the crossover in the form of intermodulation distortion products (IMD). In all of these examples, I am using a 100 Hz sine wave generated from Smaart. 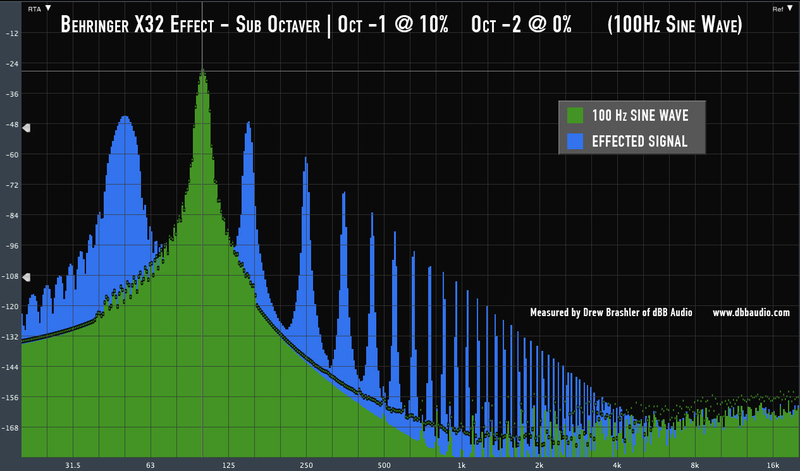 We can see when Octave -1 is set to 10% that we have sub-harmonics showing up at 50 Hz. Another thing you will immediately notice is all of the harmonic content above the fundamental frequency of 100 Hz. We can see we have harmonics at 150 Hz, 250 Hz, etc. This is the IMD that is generated between the fundamental freq of 100 Hz combining with the sub-harmonic frequency of 50 Hz. When we add in the Octave -2 into the mix, we now see sub-harmonic content at 25 Hz. But we can see all of the added IMD above the fundamental frequency! Now, IMD is actually something that is pleasant to the ear. Digital audio consoles are so clean that they don’t generate as much IMD as their analog counterparts. The ‘sound’ of vintage consoles like the SSL or the Neve is due to harmonics generated by their analog circuits. So, adding in some IMD into the mix of a very clean channel will give it a bit more grit to the sound. What do I use the Sub Octaver on? I personally don’t use the Sub Octaver. But that doesn’t mean it doesn’t have its place on our console. If you had a kick drum with a microphone that doesn’t pick up enough low end, or the kick is tuned poorly and isn’t producing low end, this would be a great tool to add. Just make sure to use it in a subtle way. This will increase the low end from 100 Hz down by around +6 dB. 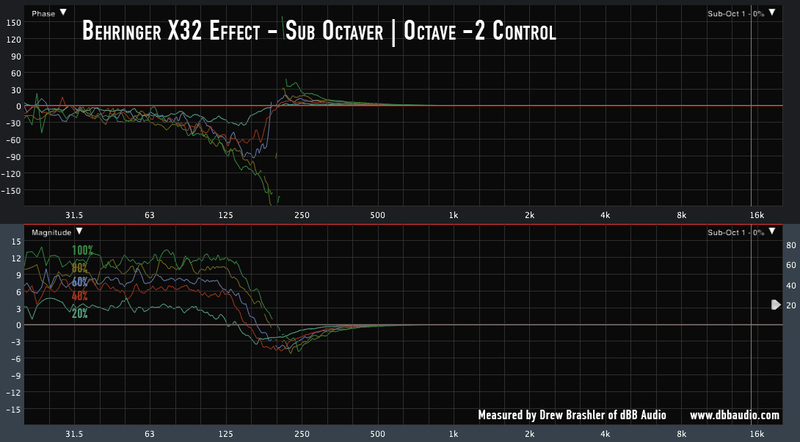 This will be a good starting point to help bring in that low end on that problematic channel that needs more low end! Want to see more Effects Tutorials? 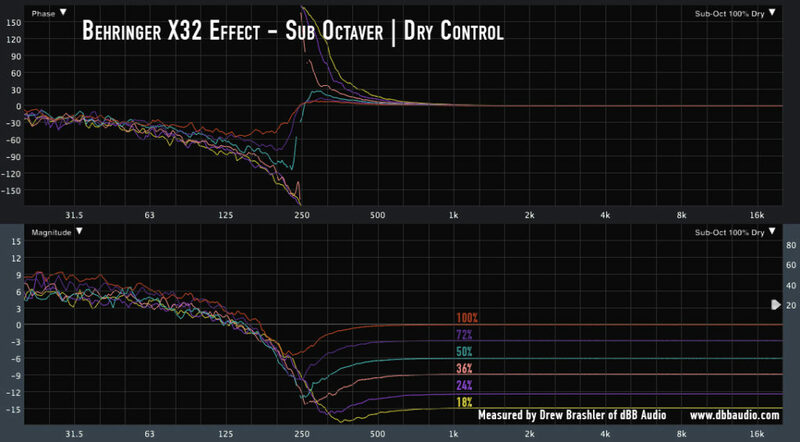 To view more of my Behringer X32 Effects Tutorials, click here: dBB Audio FX Series. This is a cool effect. I will have to give this a try the next time I have a poorly tuned kick drum come in, ir I want to pull out some extra bottom end for content appropriate music. I have set up a 50hz sine wave signal to be keyed to my kick channel, if I dont like how the bottom end sounds on a kick drum. This has helped keep the sound of the kick tight while maintaining the actual sound of the kick in the high frequencies without boomy or muddy low end sound. Thanks, DB!! Incredible content as always.